What Did the Early Spanish Settlers Eat? Edible Plants and Wild Game Feed Those Who Settled S.B. In the years following the founding of the Santa Barbara presidio in 1782, the settlers called upon a number of food sources. The South Coast yielded a variety of edible plants and wild game. As the years passed, the newcomers developed their own systems of agriculture and animal husbandry. Lastly, the settlers depended for a time on government supply ships, while at the same time building up their own trading networks, both legal and illegal. The Native American Chumash whom the Spanish encountered upon their arrival were hunters and gatherers; they were not an agricultural people. The newcomers brought some seeds with them to begin growing their own food, while additional necessities came by ship from the Spanish royal government’s depot in San Blas on Mexico’s west coast. Among the staples ordered from San Blas was a mixture of crop seeds, as well as bulk supplies of beans, rice, corn, sugar, and lard. A wide variety of spices were also ordered from the government, including pepper, nutmeg, cinnamon, cloves, even saffron. A large amount of chocolate was used by the Spanish, primarily for hot cocoa, which was extremely popular. Early on, the settlers ordered items, such as olive oil and wine, that would later be supplied from nearby sources. Unlike the Chumash, the Spanish did not utilize the rich fisheries of the Santa Barbara Channel much, although dried oysters and shrimp are found on early requisitions. Mission Santa Barbara, founded in 1786, and other missions became very important sources of supply for the Santa Barbara community. Even before the founding of the presidio at Santa Barbara, stocks of foodstuffs had been stored at Mission San Buenaventura for later use here. After the founding of Mission Santa Barbara, other missions shipped seeds here to get crops started. The primary crop was wheat, in addition to significant amounts of corn, beans, barley, and peas. As the mission’s water system developed, more sophisticated irrigation techniques were possible, making for increased agricultural yields. As time passed, the variety of foodstuffs grown locally increased. Vast herds of cattle, as well as sheep, pigs, goats, and various sorts of fowl, added more meat and dairy to inhabitants’ diets. In 1814, Mission Santa Barbara counted more than 16,000 animals among its holdings. A wide array of fruits and vegetables made their way to dining tables, including pears, apples, squash, citrus, tomatoes, and cherries, to name just a few of the offerings. In addition, most families had their own vegetable gardens. 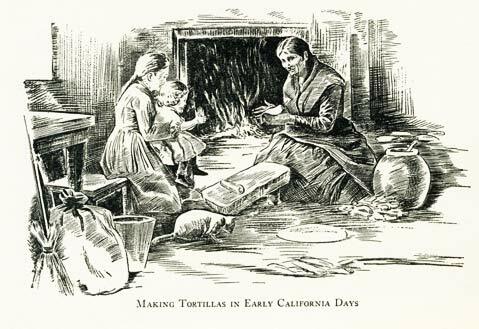 Wheat remained the primary staple; flour tortillas were an all-important element of the diet, as opposed to corn tortillas in other regions under Spanish rule. Wheat did quite well here, given the comparatively dry growing conditions. Very common was pozole, a mixture of beans with either wheat or corn, cooked with a bit of animal fat to produce a thick paste. As we well know today, vineyards thrive in this area. Wine was important to the new settlers, not only as a beverage but as a key element in the Roman Catholic Mass. Very early on, wine was shipped here from Mexico, as well as from other missions and settlements in Alta California, but vineyards were soon flourishing on the South Coast and in the Santa Ynez Valley. Another popular fermented beverage was aguardiente, a type of brandy. Mescal was shipped here from Mexico. A hearty, nonalcoholic drink, which was ubiquitous, was atole, cornmeal mixed with water resulting in a thick liquid. The beginning of the Mexican revolt against Spain in 1810 halted the scheduled annual visits of supply ships from San Blas. Trade with foreigners, forbidden under Spanish law, increased, and this trade became an important source of luxury food items. By this time, however, residents were producing their own food, supplemented by a growing trade network within Alta California.